The Federal Highway Administration has very quietly acknowledged that the driving boom is over. After many years of aggressively and inaccurately claiming that Americans would likely begin a new era of rapid driving growth, the agency’s more recent forecast finally recognizes that the protracted post-World War II era has given way to a different paradigm. The new vision of the future suggests that driving per capita will essentially remain flat in the future. The benchmark is important because excessively high estimates of future driving volume get used to justify wasteful spending on new and wider highways. In the face of scarce transportation funds, overestimates of future driving translate into too little attention paid to repairing the roads we already have and too little investment in other modes of travel. 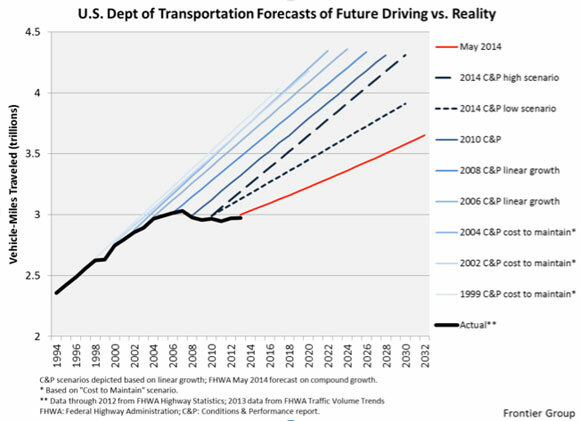 The forecast is a big step forward from the FHWA’s past record of chronically aggressive driving forecasts. Most recently, in February 2014 the U.S. DOT released its 2013 “Conditions and Performance Report” to Congress, which estimated that total vehicle miles (VMT) will increase between 1.36 percent to 1.85 percent each year through 2030. This raised some eyebrows because total annual VMT hasn’t increased by even as much as 1 percent in any year since 2004. Comparing the 20-year estimates of the “Conditions and Performance Report” issued at the beginning of 2014 to the new 20-year estimates shows the agency has cut its forecasted growth rate by between 24 percent to 44 percent. The expectation of VMT growth hinges on the expectation of rapid growth in freight travel. When looking only at cars and pickup trucks, as opposed to larger vehicles, the agency’s baseline expectation is for total driving miles to grow only 0.67 percent annually – slower than the projected population growth rate over 30 years. If so, then the average number of miles Americans travel in their commutes, taking recreational trips and running errands by car would stagnate in the decades ahead. The study released by the Federal Highway Administration and finalized last May has not been publicized, and assumes that gas prices would decline significantly from their earlier peak. The Smart State Transportation Initiative (with assistance from Frontier Group) reported earlier last year that the Department of Transportation had issued 61 driving forecasts in a row that overshot their mark. Until now, there had not been a major reconsideration of past methods, which have chiefly depended on aggregating forecasts issued by states that are seeking federal funding for highway expansion projects. As a result of the decline in driving since 2004, Americans currently drive about half a trillion fewer miles per year than they would have if the post-War driving boom had continued. Some of the reduction in recent years may be due to possibilities afforded by new technology and the distinct preferences of the rising millennial generation — factors that are not included in any of the FHWA’s forecasts. Some states, like Washington and Maryland, have begun to ratchet down their forecasts of future VMT. Ideally, U.S. DOT would officially supplant its previous forecast and feature this important shift in press releases, blogs, speeches, and other communications. The shift should be a major focus of the department’s 30-year visioning process. For U.S. DOT to embrace a future less dominated by driving, it first must recognize when change has occurred and that a different trajectory is possible. Quiet and incremental as the current changes may be, they represent a profound step in the right direction. Still looks like an upward trend to me (albeit with a smaller slope). The graph shows vehicle miles traveled, which increases just from population growth, while the revised, lower projections are based on per capita miles. It will be interesting to see if even this lowered projection of growing miles traveled will pan out. The graph seems to level out in 2004, and though recently there has been a bit of an uptick it still appears as though VMT has been static for almost 10 years. That’s a big deal. In the article you claim that the feds have been wrong but now that they agree with you they are right? This is still an overestimate. VMT per capita has been flat or declining since 2004, and it is going to remain flat or decline. There’s no practical way for people to drive more at this point (not enough hours in the day), and nobody wants to. So an estimate that VMT per capita will remain constant would be a *high* estimate of VMT. From where I am in Boston, I know few people that drive. Urban millennials seem to be less interested in owning a vehicle than their parents. I’m less certain about trucks, though. If the economy is really recovering, then people will buy more. As a result more trucks will be on the road delivering goods to homes and storefronts. I think there’s some anecdote about data and trends in there, but no need to pay any heed to that. You mean people are driving less because we are mired in the longest economic recession in US history? you mean a militant public transportation group found some anecdotal statistics to support their cause? I am shocked…Shocked I say. To prevent Climate change and also to deal with Peak Oil the US HAS to reduce driving! Auto Addiction accounts for 70% of US oil usage (37% of that still imported) and directly generates 35% of greenhouse emissions. The mainstream Environmental groups keep pushing the fantasy of electric cars which take the energy of a small house and totally ignoring transportation when they say the US could run on renewable energy. Generally the mainstream Environmental groups mean current ELECTRIC power could run on renewable energy and ignore the 35% of greenhouse emissions due to Auto Addiction. Naomi Klein takes this head on in her latest great book “This Changes Everything” pointing out over and over and over that PUBLIC TRANSIT is the number one thing we need to tackle global greenhouse emissions. Don’t get too excited. There is no official VMT reduction plan at any level of government, VMT is ticking upward again with a stronger economy, VMT does not include bicycles or peds, and transit is still the redheaded stepchild. Ideas? Dueling Forecasts: Does the Energy Dept. Know Something U.S. DOT Doesn’t?